Every year Kendal’s Volunteer Clearing House Committee compiles the volunteer hours of residents for a grand total. The annual numbers are staggering, with 2017’s all-time high of 64,000 volunteer hours. Most of the hours are from residents volunteering at Kendal, either for the Kendal at Oberlin Residents Association (KORA), which has 100+ committees and interest groups, or for the nonprofit community. Volunteer activities at Kendal include reading to children enrolled in Kendal’s Early Learning Center, arranging art exhibits in Kendal’s three galleries, working at the front desk and in the office, growing wildflowers and herbs for flower displays and dining services, and providing musical entertainment. Residents also rack up volunteer hours by helping Oberlin College and nonprofits in Oberlin and surrounding Lorain County, including churches, Mercy Allen Hospital, Oberlin Heritage Center, Second Harvest Food Bank of North Central Ohio and Lorain County Habitat for Humanity. As Anne Elder, chair of the Volunteer Committee likes to tell residents, if you don’t find what you want or would like to suggest a new opportunity, let her know. The committee started tracking volunteer hours in 2000 and estimates that the financial value (based on Independent Sector’s valuation of a volunteer hour, currently $23.33 in Ohio) is approximately $16 million. Volunteering at Kendal is year-round, but during National Volunteer Week which ends April 13, we’d like to spotlight one of KORA’s oldest volunteer projects. Kendal’s first residents arrived in October 1993 and the following month a community newsletter called The Ad Hoc Newsletter began operations. The editor, Art Steele, knew the name was temporary and explained to an Oberlin News-Tribune reporter that he came up with the name Kendalight after walking by the lighted spire on Kendal’s community center building. The name stuck. Today, The Kendalight arrives in resident mailboxes by the first of every month. Residents keep a copy handy, often hanging it on their refrigerators for daily reference. An electronic color copy is posted on KORA’s website. “We’re telling you what’s coming up, not recapping what’s happened,” explains Elizabeth Aldrich, who has been managing editor since 2006. The all-volunteer staff also includes associate editor Suzanne McDougal, Mary Simons and others, photographers Sally Nelson-Olin and Gary Olin, and production manager Don VanDyke. It’s difficult to add up the total number of volunteer hours from The Kendalight staff, but certainly, it’s four digits — Elizabeth alone estimates she volunteers about 350 hours annually for the newsletter. “The reporters are the residents,” Elizabeth says, and the “reporters” quickly learn to submit articles electronically (“we don’t do hard copy”) by the 15th of the month. Issues are typically 12 pages, with the back page reserved for a detailed calendar of events. Articles include information about movies, lectures, musical performances and other activities happening at Kendal, at Oberlin College and in the city (with information on carpools and buses). Updates from KORA and other committee reports are published, along with public service articles about recycling, severe weather preparedness and the like. Barb Benjamin compiles and shares “Kendal Nature Sightings,” Nina Love submits an original “Kendal Kryptogam” word puzzle and the Dining and Nutrition Services staff announces upcoming dining events and food-related news. The issue usually includes a reminder to “wear your name tag” and “In Memoriam” to honor residents who have passed away during the month. Bridge Results, which appeared in the first Kendalight, continue to be published. A fairly new feature is Stay Connected, which offers tips on how to keep in touch with friends and neighbors living in the Stephens Care Center, especially those experiencing dementia challenges. Occasionally cartoons appear, but not editorials or letters to the editor (though staff did get a good laugh at a letter from a four-legged resident complaining about another dog). 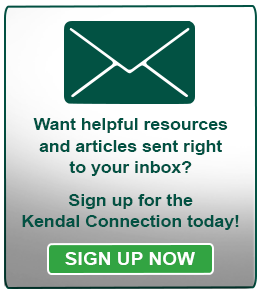 “More About Kendal Residents” is a column for new residents to introduce themselves. The Resident Biographies committee receives the bios and prepares them for both The Kendalight and the “Who’s Here” bio books in the Kendal library. The resident section also lists upcoming moves, recent move-ins and recent transfers. “We’re on the ‘Try It, You’ll Like It’ tour for prospective residents and they always say how much they enjoy getting The Kendalight and the calendar,” Elizabeth says. The Kendalight is also mailed to Priority List members. “I remember thinking if I was there I could do this or that activity,” recalls Suzanne, who moved to Kendal from Alexandria, Virginia, two years ago. 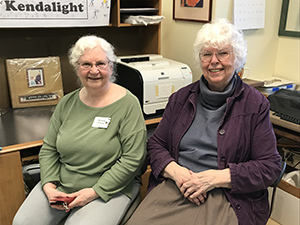 On a recent afternoon, just after the April Kendalight was published, Elizabeth and Suzanne sat down in the “newsroom,” tucked inside the Craft Room, to talk about their fondness for publishing. Elizabeth got her first typewriter when she was seven and was editor of her New York City high school newspaper. She left Oberlin College one semester shy of graduation to work at Metal Progress magazine in Cleveland. After a 20-year career as managing editor, she returned to Oberlin to complete her degree and embarked on a second career as a counselor to non-traditional students at Cleveland State University. When she arrived at Kendal in 2004 she went looking for her niche and quickly found it. Suzanne was a math major and got involved early on in computer programming. She worked as an employee or contractor for such companies as Alcoa, Prudential and Medtronic Data Systems. “Then I evolved into a technical writer/editor, with my specialty being able to understand computer geeks,” she says. 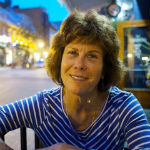 Suzanne is also a desktop publisher and has helped publish several books and newsletters. She had her eye on volunteering for The Kendalight before she even moved in. The two women are also active in other volunteer activities, both at Kendal and elsewhere. Elizabeth is LWV Oberlin Area secretary (she used to edit its former newsletter) and schedules staff for the weekly Farmer’s Market booth of Santa Elena Project of Accompaniment (SEPA), which finances scholarships and teachers’ salaries in two Guatemalan indigenous villages. Suzanne is a member of the KORATech team and is layout editor for the American Scottish Gaelic Society’s newsletter. When the two women look back at old issues of The Kendalight, they often smile as they read about issues and activities still on resident minds today. For instance, the January 10, 1994 issue included articles about recycling and volunteering. “Someone said to me the other day that The Kendalight helps make us a community,” Suzanne says. Others might add, the newsletter has been doing so almost since day one.